Below you will find a number of common questions along with answers from Alfa Laval’s experts. Don’t see your question here? Contact us today to get a personal response from our experienced team. For a quick and simple selection of standard products, you can also explore our Product guide. What determines the size of a heat exchanger? For general heating applications, it is not the kW that determines the size of the heat exchanger, but the pressure drop allowed. This is because the applications are low NTU. Other factors that determine size include the approach temperature and the plate material selected for the heat exchanger. What type of products can Alfa Laval offer for steam heating applications? Alfa Laval has several products that are suitable in steam heating applications, but the preferred types are gasketed units with a deep pressing depth. The TS and M-types with low theta plates are best suited for these applications. Brazed and fusion-bonded heat exchangers could also be used, as they are extremely compact. However, these may be more sensitive to thermal fatigue. Such units should therefore be avoided for applications where they are exposed to large, sudden and frequent temperature changes. How do I choose the right paint standard for my application, and what types of paint systems does Alfa Laval offer? While we paint our products for aesthetic reasons, our main purpose is corrosion protection. Choosing the correct paint system is essential for protecting the unit from corrosion. There are many aspects to consider when choosing a paint system. The environmental conditions present where the unit will be in service are of particular concern. Is there a specific corrosion class? Will the unit be placed indoors or outdoors? Will it be subject to any severe pollution? Splash of acids or alkalis? Will it be for an offshore/marine/costal environment? Will the unit be insulated or uninsulated? Is there a risk of continuous condensation or not? All of these parameters call for different paint systems. Alfa Laval has 14 different paint systems divided into the different corrosion categories C2, C3 and C5. Some of these are for specific applications. Contact your Alfa Laval sales representative for guidance. Why is asymmetry so important in heat exchangers used as condensers for heat pumps? The narrow channels on the refrigerant side allow for higher internal velocity, enhancing heat exchange even at partial load. At the same time, the larger channels on the water side reduce pressure drop throughout the unit. Together, this has a positive effect on the heat pump’s coefficient of performance, improving performance for the whole system. Why is a water-side filter so important in brazed and fusion-bonded heat exchangers? In the water circuit, there are many small parts and debris in circulation. Most of these are welding residuals, which can be trapped in the small channels of the unit. This can cause a number of problems, ranging from higher pressure drop to irregular fluid distribution across the plates and even corrosion that leads to leakage between the circuits. Why can refrigerant pressure drop be particularly high in brazed heat exchangers used as evaporators? Brazed heat exchangers, even longer or taller models, operate with an internal distribution system that distributes refrigerant in all channels. These distributors must have a dedicated geometry, often with small passages and chambers. This, in turn, can lead to pressure drop in many cases. However, this is not a problem in itself as long as the expansion valve is designed accordingly (in most cases, slightly bigger). Why are AlfaNova fusion-bonded heat exchangers more resistant to corrosion than brazed heat exchangers? AlfaNova heat exchangers are copper free—built with 100% grade 316 stainless steel. In brazed designs, copper is the material that holds the stainless steel channel plates together. Unfortunately, copper is less resistant to certain types of corrosion, such as in applications where ammonia is used as the refrigerant or where there is aggressive water due to, for example, higher chloride content. In these applications, the 100% copper-free AlfaNova model is therefore recommended. Why is the refrigerant inlet connection so important for 2-phase evaporators? The S3 refrigerant inlet connection is more than a connector for brazing the copper pipes. It is a pre-distributor, and its geometry influences the distribution of refrigerant along the unit. The internal diameter of the S3 connection impacts the velocity and turbulence of the fluid, so the refrigerant is equally distributed in every single channel. With each additional plate in a unit, S3 geometry becomes more and more important. Alfa Laval’s evaporators are optimized with dedicated connections to achieve the best performance depending on refrigerant, number of plates and application. Can the same brazed or fusion-bonded heat exchanger be used both as a condenser and as an evaporator? Yes. This is possible and has been done in many different applications. The distribution system of evaporators does not jeopardize performance when used as condensers, and the additional pressure drop is generally negligible. However, the condensation needs to be full of subcooled liquid at the condenser exit, as a partial condensation can lead to problems. In reversible systems, it is recommended that the condenser have a distribution system in order to provide decent performance as an evaporator as well. How do I ensure oil return in evaporators? The design of both the distribution system and the channel plates in Alfa Laval evaporators ensures the return of the oil to the compressor. This is particularly relevant to inverter-driven compressors, because the amount of refrigerant and velocity can vary greatly in the course of operation. Software that verifies the performance of the evaporator at minimum load is mandatory in order to ensure safe operation. Can the same brazed or fusion-bonded heat exchanger be used with different refrigerants in 2-phase applications? Yes. 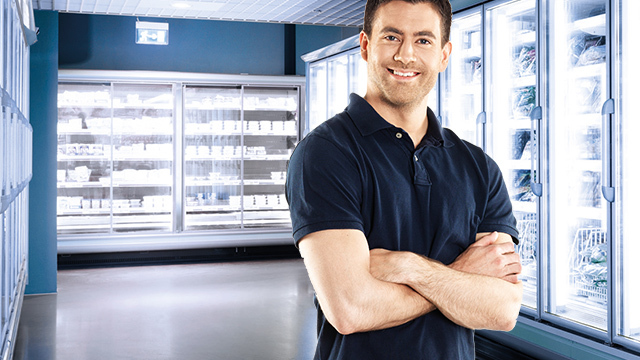 Alfa Laval heat exchangers can be used with many different refrigerants. During the initial design phase, one heat exchanger can be optimized for one or two main refrigerants. Alfa Laval’s latest technology is highly flexible for both inverter-driven compressors (with high capacity variations during operation) as well as the growing number of new refrigerants entering the market due to environmental reasons. Thanks to innovative distribution systems and the new channel plates design, this flexibility allows the units to be used with many different refrigerants at high performance. What is important to consider when it comes to freezing in heat pumps? Freezing is one of the main issues to consider in heat pump operation. Alfa Laval heat exchangers are specifically designed to avoid freezing during defrost in air-to-water heat pumps. Nevertheless, preventing freezing depends on the operative conditions you set for the system, especially with regard to compressor capacity, brine flow and temperatures. Alfa Laval regularly performs simulations, both in a laboratory and via software, which can help you identify the limits for safe operation. What are the maximum and minimum allowed capacities for a certain brazed or fusion-bonded heat exchanger? Maximum and minimum capacities are both determined according to levels of acceptable performance. As capacity increases, the unit can experience lower evaporating temperature, higher condensing temperature in 2-phase applications, higher temperature difference in 1-phase applications, as well as water or brine pressure drop. All of these lower the overall performance of the system. Conversely, the lowest possible capacity is limited by oil return to the compressor and the related possible drop due to the reduced velocity into the channels. What is the minimum temperature difference you can have between the two sides of a gasketed plate heat exchanger? Customers today are focused on saving more energy, and the trend in heat recovery duties is for minimal additional cooling/heating to recover more energy. That means that the units will work with a smaller temperature difference. For liquid/liquid duties, Alfa Laval offers plate heat exchangers that can work down to a temperature difference of about 1°C. Compare this to shell-and-tubes, where the limit is around 5°C. The reason why we can work with such a low temperature difference is that our units have an arrangement that is almost counter-current. What is the maximum temperature difference you can have between the two sides of a gasketed plate heat exchanger? If looking at liquid/liquid duties from a thermal point of view, there is no maximum limit. If you have very high temperature differences, which also includes very high temperatures, you should take into consideration the radiation effect. However, since Alfa Laval has a maximum design temperature of around 180°C for gasketed plate heat exchangers, this is not an issue. When you have a large temperature difference, it can be a large temperature difference between the bulk temperature and the wall temperature. You should check the wall temperature to avoid boiling or freezing as well as excessive fouling. Depending on the media, different gasket materials are more or less suitable. In HVAC applications where the media tends to be water/water, the recommended gasket material is NBR, which is available in several different qualities. What is the gasket lifetime? Gasket lifetime depends on many different factors, most importantly the operating temperature and pressure, and the media in question. However, the lifetime is also determined by the cleaning agents used, how often the plate heat exchanger has been opened and closed, if the heat exchanger is used in continuous operation or not, and how the gaskets have been stored. If the plate heat exchanger is running at the maximum recommended temperature, the gasket lifetime is one year. The lifetime will be longer at a lower temperature, but all of the factors listed above must be considered in order to reach a rough lifetime prediction. How do I know which type of gasket I have in my heat exchanger? There are three ways to identify the gaskets. Start by finding the documentation that was supplied with the unit at the time of purchase. Next, look for a tag on the gasket with the article number, which you can find on our new T-range. If your gaskets do not have this tag, you can look for a colour code, which is typically located on the clip of the gasket. In some cases, the colour code is on the inside of the gasket, and this can sometimes even be seen from the outside. Contact Alfa Laval with this information and the information located on your unit’s name plate, and our representatives can help you determine your model and gasket type. Is it mandatory to use an ASME pressure vessel code when specifying AHRI-certified plate heat exchangers? No. Any pressure vessel code can be used. The certification is about thermal performance only and has nothing to do with mechanical performance and quality in general. Is the AHRI LLHE certification program only valid in North America? No. Customers are free to specify AHRI LLHE certification anywhere in the world. In North America, however, members of the certification program must offer certified models to customers if the duty is within the scope of the program, regardless of if AHRI certification has been specified in the bidding documents. How can customers receive verification that the manufacturer has sized the plate heat exchanger in accordance with the AHRI LLHE certification program? This is very simple. Customers can send the manufacturer’s specification sheet to AHRI and the AHRI staff will then verify the sizing – free of charge! Is it complicated to specify AHRI-certified plate heat exchangers? Can the AHRI Certification Program be used in industries other than HVAC? Yes. Customers in any industry may use the AHRI LLHE certification Program for any duty covered by the scope of the certification program.